Flood-hit councils could be slapped with huge tax bills from the Scottish Government – just for cleaning up after storms. Alison McInnes has warned that local authorities could be stung for tens of thousands of pounds as they attempt to repair storm ravaged areas. Impoverished councils could have to pay a landfill tax of more than £80 for every tonne of rubbish they clean up in the wake of floods, as well as almost £25 for disposal as well as haulage costs. With “massive” amounts of debris to be cleared in the wake of major storms, such as Frank and Gertrude, Ms McInnes is now demanding the Scottish Government exempt flood-hit councils from the charges. The North East MSP said: “I have asked ministers to ask you to consider whether an exemption can be granted from landfill taxation arising from the clear-up after the recent flooding. “It does seem rather unhelpful to say the least for a tax to be levied in such circumstances. “Accordingly I am urging the Scottish Government to give a dispensation in these unusual circumstances. After all the flooding was the worst we have seen in the north-east in living memory. “For example, Aberdeenshire Council currently faces paying a cost per tonne of £82.60 for landfill tax plus £24.61 for disposal, as well as haulage costs. “The debris is massive in scale and much of it cannot be separated out easily, for example wood with plastic and polystyrene stuck together. Homes were evacuated, roads were washed out and caravans and sheds washed away during a series of major storms that hit Scotland in December and January. Trains and flights were cancelled in Aberdeen and across the surrounding region as water levels reached record highs. Landslides and overflowing rivers also closed dozens of roads. At the beginning of January, First Minister Nicola Sturgeon visited some of the worst affected areas in the north-east. 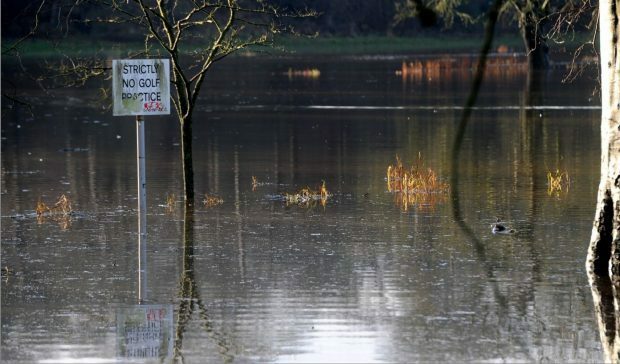 A Scottish Government spokesman said: “A funding package of around £16 million has been provided by the Scottish Government to support those affected by the recent flooding.